Also in October: Our Harvest Celebration! Plan to join us for our annual celebration of all things CommonWealth! 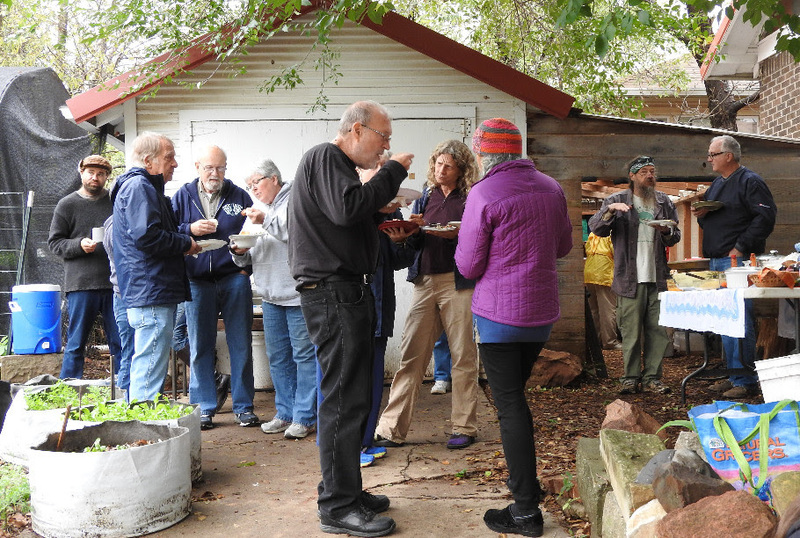 Bring a dish of homemade food to share with the neighbors, CommonWealth community team and volunteers as we pause to honor all the growing we have shared together since we last stopped to celebrate, last fall. We’ll set the feasting table, offer some activities and tours and generally have a great time—and lots of conversation—together as people who share a love for clean, nourishing food grown in community in every available inch right in the heart of the city! CommonWealth’s cut flower garden is in full glory this month. Rain + a bit of luck + lots of hard work = gorgeous flowers! Planning a wedding, house party or other event? In addition to selling weekly bouquets and custom-made arrangements, we also offer bulk flowers by-the-bucket. This is a economical DIY option for having fresh, local, sustainably grown flowers at your next event. 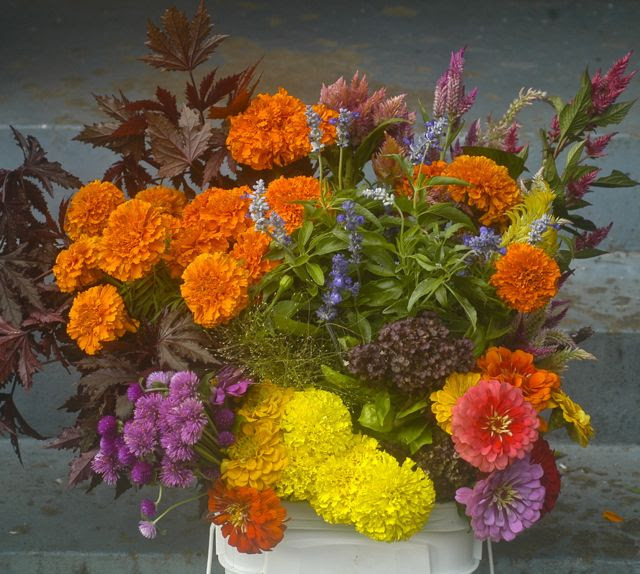 The photo here shows an example of a $60 bucket, with orange and yellow marigolds, zinnias, ornamental basil, blue salvia, celosia, gomphrena, frosted explosion grass and red-leafed hibiscus. Email us if you’re interested. We’ll have flowers available through the month of October, and again starting in the spring. Jody Lesch is a CommonWealth story, indeed. She learned about the urban farm during an Oklahoma City Urban Ag tour three years ago and began volunteering on Saturdays, working in the garden. It wasn’t long before she began to apply her interests—in pollinators and the habitats they love—to the work at CommonWealth. Before volunteering at CommonWealth, Jody had volunteered at the Oklahoma City Zoo where she worked in the Pollinator Garden, and where she learned about Monarch Butterfly migration and how to tag them. At CommonWealth, she soon started researching what could be planted in a Pollinator Garden: what plants different pollinators like. 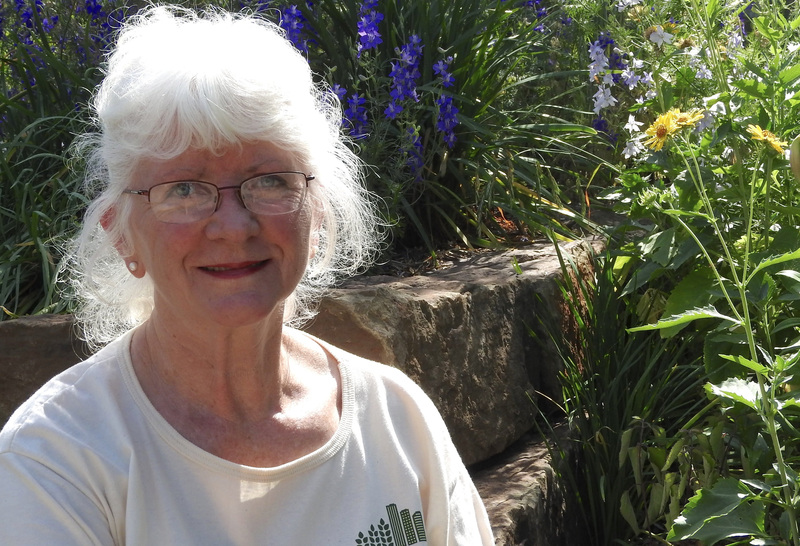 She and Lia developed the pollinator garden and now she is part of the core team, overseeing the care of the pollinator plants and organizing the Saturday Garden School. The learning at CommonWealth goes beyond farming and gardening, says Jody. “I appreciate Lia and Allen. They are so gracious in their sharing, open to all who want to learn and help—not just gardening, but how to be good neighbors and community; how to be a better neighbor. It makes a city a better place. “The thing I like the best about CommonWealth is being around a group of people who like the same things I do and don’t think I’m crazy for liking what I like. We have common goals and learn together. It’s an oasis. I wish every neighborhood could be an oasis like CommonWealth—getting out of their backyards into their front yards and getting acquainted. Belonging to the order Mantodea and sizing in at an adult length of 1 – 16 cm. A relative to termites and cockroaches. The Master Zen Assassin itself. The Praying Mantis. 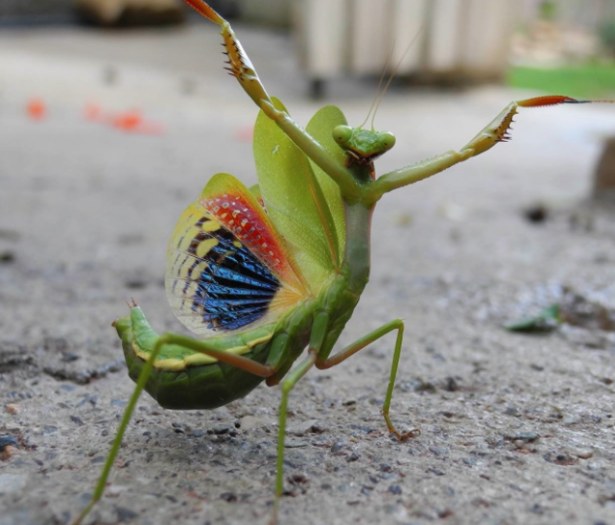 This article is inspired by the rather large Mantis that crossed my path the other day while watering a freshly planted bed of Arugula in the Hoop House. Brown colored and looking to be about 4 inches in length it is one of the larger ones I’ve come in contact with to date. Although the Mantis is a relatively common garden insect, easily identified by most hominids, there is something altogether fascinating about this particular creature, something captivating. The Mantis is considered a beneficial in the garden as they are voracious eaters of all insect pests. They aren’t exactly picky however and will devour just about any creeper, crawler, or flyer that they can ensnare in their pincer kung fu grip. In fact, larger sized Mantids have been known to feast on lizards, small mammals, and the brains of small to middling birds such as hummingbirds. As ambush predators with reflexes more than double the speed of houseflies, the mantis’ agility, precision, stealth and camouflage are its most skilled tools of carnage.